You are currently browsing the The Pet Product Guru blog archives for the day Tuesday, May 15th, 2018. Generally speaking domestic cats do not like to get wet. They prefer not to have a bath. Most are not interested in even going near the backyard pool. Cats can swim and like dogs, they are natural swimmers. 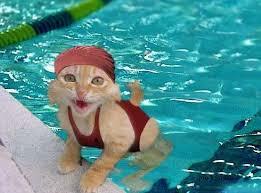 If fact, cats that are native to a warm climate such as lions and tigers seem to enjoy the water and swim very well. They do this sometimes to catch fish and sometimes just to cool off. By contrast, wild cats from cold climates such as bobcats, cougars and snow leopards dislike swimming and don’t even like to get wet. One house cat that loves to swim is the Turkish Van. He was a house cat in Turkey for years and was known as the swimming cat. Don’t toss those cat toys in the pool just yet, keep your cat dry and he’ll be a lot happier! The greatest oldies and standards in one place, Edgewater Gold Radio--your oldies and standards stations! Download the free Edgewater Gold Radio app or listen online from our website: Edgewatergoldradio.com.